Just before the International Jazz Festival, another global gathering takes place in Montréal as a flock of academics, artists, activists, students and enthusiasts of all kinds will come from all over to participate in the IX Encuentro. Université Concordia will serve as the hub for this week long conference-festival hybrid that opens on Saturday, June 21st. Activities and events for registered participants will be held in various venues beyond the streets of Outremont, to the PHI Centre in the Old Port, to the Plateau cultural centers of Sala Rosa and Oboro Gallery. On June 28th, Encuentro will close with a final performance and party in the cabaret palace, the Rialto. Events that are open to the public can be found here. -- is the brainchild of the institute's director and founder, professor of Performance Studies, Diana Taylor. Usually held in different sites throughout the Western hemisphere, the program created to foster experimentation, dialogue, and collaboration, typically entails a series of keynote lectures, performances, teach-ins, workshops, working groups, exhibitions, screenings, installations, roundtable and long table discussions as well as urban interventions and trasnacheo -- a nightly cabaret. In part to capture both the urgency and breadth of this particular moment, various participants were invited to deliver 5 minute manifestos throughout the week. Previous themes and locations include the inaugural "Performance and Politics in the Americas" (2000) in Rio de Janiero; "Performing 'Heritage': Contemporary Indigenous Performance and Community-Based Practices" (2005) in Belo Horizonte; "Corpolíticas/Body Politics: Formations of Race, Class and Gender in the Americas" (2007) in Buenos Aires and "Staging Citizenship: Performance and Politics of Cultural Rights" (2009) in Bogota. Last year, "Cities Bodies Action: The Politics of Passion in the Americas" was held in São Paulo. 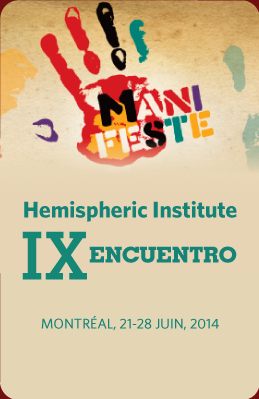 In the 15-year history of the institute, this is only the second time that Encuentro will be held in North America. In 2003, under the thematic banner of "Spectacles of Religiosities," Hemiites gathered in New York City. The chosen theme this year, "Manifest: Choreographing Social Movements" could not be more aligned with its host city given the pulse of protests and political festivities that have occurred there historically and more recently. For Mark Sussman, Concordia's Associate Dean of Academic & Student Affairs, the Convener of ENCUENTRO 2014, hosting this meeting has multiple significance. He said "In Canadian higher education, the creative side of academic research has been gaining ground and visibility. It is an ideal moment for a gathering of artists, scholars, and researchers who work in both traditional and experimental forms of knowledge creation to come together under the banner of Performance Studies, a field more advanced in the U.S. but achieving momentum in Canada." Moreover, the theme allows for possibilities of multiple levels of exchange among those present. Paraphrasing French sociologist Marcel Mauss, who wrote of "les techniques du corps," Sussman adds the hope with this encounter is "to build together and begin disseminating an archive of shared knowledge: 'les techniques des manifs.'" To be sure, techniques of manifestations are not only expanding across the world but continue to intensify. This sentiment was articulated by Diana Taylor who wrote, "We have only to think of movements driven by outrage against political, social, and economic injustices such as the so-called Arab Spring, the Indignant of Spain, Occupy Wall Street, student movements erupting in Chile, Mexico, Montreal, the 'Dreamers' who spearhead immigration reform in the U.S., to name a few. BASTA YA! / ENOUGH! The Zapatistas proclaim, a position shared by Idle No More and the Mapuche and other Native groups throughout the hemisphere." Indeed, Idle No More will certainly be present at Encuentro bringing Hemiites and the broader Montréal community together for an organized flash mob round dance downtown. Karina Hodoyan (Mexicana-Xicana), Kevin O'Connor (Settler/ally) and Alex Wilson (Opaskwayak Cree Nation), organizers in the Indigenous social and environmental justice movement that exploded on the Canadian political scene in 2012 and has since extended its reach globally, noted "Flash mob round dances as protest performances took place in shopping malls, street intersections and public/political spaces across Canada and continues to do so. These round dances opened up space for Indigenous and settler participants to move together and create a space for questioning, discomfort and potentially reconciliation." Their aim is to use the round dance as a form of consciousness raising around "the impacts of colonialism on queerness, sexuality, gender, race, ability, and how these are interconnected to the ongoing exploitation of humans, other species, and our environment, through the transgression of space and movement of bodies." This event is scheduled for Friday June 27th at 5pm. All are welcome! Throughout the week, there will be performances by Hemi veterans and newcomers alike such as Carmelita Tropicana, Guillermo Gomez-Pena and La Pocha Nostra (U.S), Julio Pantoja, Peggy Shaw (U.S.), Aluna Theatre (Canada), Teatro Buendía de Cuba, Marie Brassard and Alexander MacSween (Infrarouge) and Spider Woman Theatre (U.S.), Bread and Puppet Theatre, Lenelle Moise (U.S./Haiti), Wura Ogunji (Nigeria/U.S. ), Gabrielle Civil (U.S./Haiti) and Rosamond King (U.S./Gambia) and a slew of others. (Full disclosure, I am an active member of the institute who will also perform in my second Encuentro). There is much productive potential in the collision that will inevitably ensue as we congregate to express ourselves, exchange ideas and concerns. This year Encuentro faces a new challenge adding French as a fourth official language in addition to English, Spanish and Portuguese. When translation is not available, as resources are rather limited, Hemi invites everyone to participate as "active interpreters" for the person standing near. A collective exercise. A sense of recognizing what it means to engage with our differences in attempts to be part of and create community. Idle No More's Alex Wilson who will be attending her first Encuentro anticipates this assembly for this very reason. She said: "what Idle No More has done is provide a space and a place for indigenous peoples and non-indigenous peoples to come together. I think that Encuentro is doing that as well. It is providing a space not just to celebrate but to use our bodies to reclaim space and move forward... just by coming together, we are reconnecting and in a sense restoring our future." Onward we go as this rasanblaj (Haitian Kreyòl for gathering) gets us ready to manifest!